"In our tradition, people die three deaths. The first death is when our bodies cease to function . . . . The second death comes when the body is lowered into the ground, returned to mother earth, out of sight. The third death, the most definitive death, is when there is no one left alive to remember us." Quoted from: Victor Landa, from San Antonio, TX, explaining the thinking behind Mexico's Los Dias de los Muertos. ​Happy Day of the Dead! In Mexico, people traditionally celebrate The Day of the Dead (Los Dias de Los Muertos) on November 1 and 2 of every year. From what I've heard (and please, correct me if I'm wrong! ), it's a festive celebration of remembering our loved ones who have died. The celebration is becoming more and more popular here in America, too. Perhaps it is because, like me, people want to find ways of honoring and remembering the lives of our loved ones who have died and take comfort in the idea of them being to return, if only briefly, for one day to say hello. I really liked Victor Landa's quote today because he really points out to us that there is more than one way of dying, and conversely, that there is more than one way of living. Renegade Thought of the Day: What scares you more: dying a physical death or being dead and then forgotten by everyone on earth? Renengade Challenge: Take a moment to remember (and perhaps reconnect with!) your loved ones and ancestors who have departed this earth. ​Some people might say that falling in love is the scariest thing there is. Well, let me tell you--it's even scarier when the person you love turns into a vampire! To give you a little context for this quote, you'll need a bit of background info. So the story starts out with the lovely Lucy hanging out with her girlfriend Mina. Lucy apparently has guys just knocking down her door to marry her because she gets 3 marriage proposals: one from a doctor named John Seward, one from an American named Quincey Morris, and one from a guy from a good English family named Arthur Holmwood. She ends up choosing Arthur, but unlike the real world and in high school, everyone ends up staying friends. Unfortunately for Lucy's fiancé, Lucy starts looking pale and mysteriously losing blood. Not thinking much of the two little bite-sized holes on her neck, the men decide Lucy needs blood to stay alive, so Holmwood gives her some of his. It helps for a bit, and Holmwood runs home to check on his ailing father, but then she's back to the same pale, almost dead place, so Dr. Sweard (who still loves her) infuses her with some of his blood. That's when he says today's quote, which is really a sweet thing for him to say, since she didn't choose to marry him and all. Alas, Lucy still dies. Well, kind of. She actually turns into a vampire and starts crawling out of her tomb at night and going on the prowl until. . . well, I don't want to spoil it for you, but it ends in a gruesome blood bath! And things don't go too well for her friend Mina, either, whom Dracula has an attraction to! Renegade Thought of the Day: What do you think is the scariest part of falling in love? If you fell desperately in love with someone who only liked you as a friend, would you donate your own blood (or plasma--see why here!) to save that person's life? Renegade Challenge: Look into donating blood or plasma and truly saving a life! Bonus Helpful Halloween Recipe and Tip: If a Vampire knocks on your door, never let him (or her!) inside. They have to be invited in. And if they do get in? Well, try offering them some of that extra garlicky hummus dip you have sitting in your fridge! "If you only read the books that everyone else is reading, you can only think what everyone else is thinking." Make time to read what YOU want to read. ​I'm not sure I one hundred percent agree with today's quote by Haruki Murakami, one of the best writers in the world today. After all, I'm an English teacher and when I have the whole class read the same book, trust me, there are a lot of different opinions! Yet I do agree with his point: stretch and challenge yourself as a reader. Don't just read what your friends read and agree with what your friends think about what they read. Dare to read what others won't. Why? Well, perhaps as a result, you'll have something new and unique to bring to the conversation. Renegade Thought of the Day: How do you decide what to read and not read? If you could read whatever you wanted (even if it hasn't been invented yet), what would it be? Renegade Challenge: Try to read a book that's different than what a lot of your friends are reading and also different from what you would normally read. Bonus Video: Meet someone else who thinks for herself: Koko the Gorilla, who's amazing at talking through sign language. She just turned 44 and got to pick out two kittens for her gift. I'm so jealous!! "If you really want to make a friend, go to someone's house and eat with him...The people who give you their food give you their heart." Who do you enjoy breaking bread with? I just got home from having what we call Family Sunday Dinner. It's always fun and there's always too many leftovers, but you know what the best part is? We aren't even all related. But it kind of reminds me of Chavez's quote today because when you start sharing dinner with people on a regular basis, they do become sort of like family to you. When you are sharing your food and your time, you are also sharing your stories and your lives. It's a truly bonding experience. Who farms the food you eat? I'd also like to take a minute and talk about Cesar Chavez. When you're biting into a plate of food, do you ever stop and think about where your food came from before it hit the grocery store? Well, Chavez knew first hand where it came from. He was a Mexican-American who grew up doing migrant farm work with his family in the fields. ​made lives better and safer for farm workers all over the country. Renegade Thought of the Day: Do you enjoy dining with people or alone the most? Why? Pretend you are going to a friend's house for dinner and need to bring a food that symbolizes friendship to you. What would you bring and why? Renegade Challenge: Consider having a dinner party or at least mix it up a little with your lunch time crew. Bonus Video: You have to make time to watch this eye-opening 2014 ABC News video on what farm work is like for workers today. I couldn't even believe some of the things I saw. Bonus Video: Watch the 2014 Cesar Chavez movie trailer below! I'm adding it to my must-see list! "There's a famous old story in the journalism world about the news anchor Dan Rather. He was a young and inexperienced television reporter working for a second-rate TV station in Houston, Texas, in the early 1960s, when a monstrous hurricane barreled through the Gulf of Mexico, headed toward the island of Galveston. All the other reporters, it's said, scrambled for the shelter and safety of their mainland newsrooms. But Dan Rather drove over the bridge and waited for the storm. When it bore down on Galveston, . . . . he delivered live reports from the windiest and most dangerous heights. He might have failed that day. He could have been injured or killed, in which case, he would have become a footnote, known fleetingly as the guy who inserted himself into a hurricane and died, ruined by his own ambition. Instead, though, the gamble paid off. He survived the storm." Today's quote comes from A House in the Sky, a true story about a young woman (Amanda) and her ex-boyfriend who were captured, tortured, and held hostage for more than a year by a radical rebel Islamic group in war-torn Somalia until their families came up with enough money to rescue them. This book was a page-turner that I couldn't easily put down, and I was impressed by how Amanda kept finding ways to stay positive, thankful, and kind despite being chained up in a dark room for hours on end. It's a must read for anyone considering a job in journalism. As a child, Amanda grew up always being curious about the world. She loved reading National Geographic magazine and dreaming about places she'd one day love to visit. So when she got old enough, she saved up the money she earned as a waitress and used it to spend months traveling abroad. Each time, she went to places a little more dangerous and tried to get work as a reporter. She worked in Pakistan, Syria, and Sudan before going to Somalia--a place where hardly any reporters were willing to risk going. Amanda kept the story about Dan Rather in the back of her mind. She knew that if she wanted to earn a living as a journalist, the one way to break through the pack and get a good job was by covering the most dangerous places that most journalists wouldn't dare visit. Unfortunately, her trip to Somolia didn't pay off, as she and her friend were captured only spending a few days in the country. Truly, she was lucky to live and be able to tell her story to others. One thing I noticed about Amanda's captors--most of them teenage boys--is that even though some of her captors were terribly cruel, others were quite nice and had no interest in hurting her. They were just following orders so they'd get some money when her ransom was paid. Somolia is terribly poor, and back in 2008 (the year she was captured), there weren't many schooling or career options for its male citizens--and still aren't today. ​Most young men choose to join a gang for protection from other gangs, and capturing a Western hostage is the ultimate way to obtain the money they desperately need--for food, clothes, working phones, and even more complex things like weddings and travel. If they had better opportunities for schooling and jobs, perhaps they wouldn't need to rely on gangs and violence to get a head. Amanda realized Somalia's lack of educational opportunities, and after she was released, she worked with various charities that support food relief and educational opportunities in Somalia, including the Global Enrichment Foundation, which she founded. Renegade Thought of the Day: Is there any career goal that you would risk your life to accomplish? Explain. Would it be worth the risk if you only ended up as a "footnote" in a newspaper article somewhere? 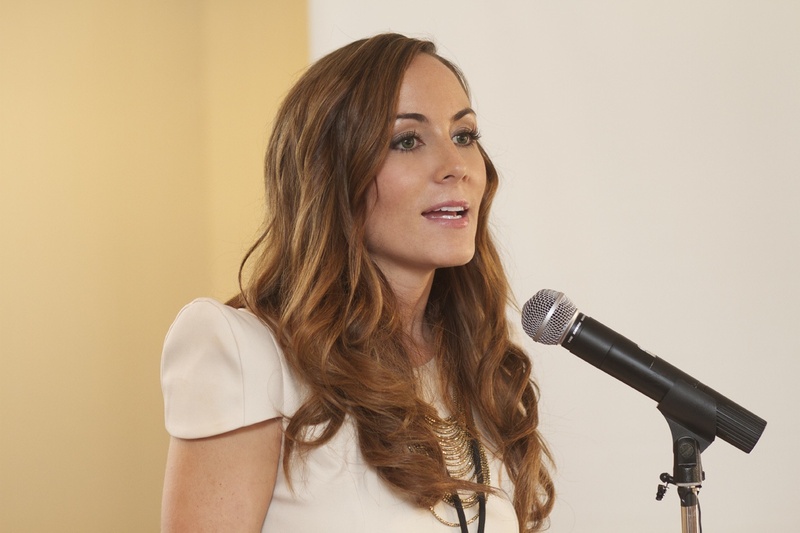 Bonus Video: Amanda Lindhout discuss her time as a Somali hostage in many news videos on the web, and some contain graphic details that may not be suited for all ages. The following video from her publisher, however, simply shows Amanda sharing her love of travel and discussing the inner strength that helped her survive her difficult year and a half as a hostage. ​Bonus Video: Check out a quick clip of Dan Rather's first ever live hurricane coverage (jump to 55 seconds to see him wade waist-deep for the story). What do you think? Would you wade through the thousands of snakes swimming to higher ground and risk electrocution to obtain your dream job? Happy Friday! Today we end a week of celebrating Native American culture with Chickasaw writer Linda Hogan (but don't worry! We'll keep posting Native American writers in the future!) Although I have only read her poems, I love the above quote from her book Dwellings and how she ties nature in with the spiritual world in a comforting way. I've really never thought of my existence as being "the result of the love of thousands"
Renegade Thought of the Day: Do you know who your ancestors are? Why do you think some cultures place a lot of value on elders and ancestors? If your ancestors could speak to you, what might they say? Renegade Challenge: The next time you're in nature, listen for your ancestors. Bonus Comic: How accurate do you find the picture below?? ". . . they're losing the ways / don't know how to talk indian. . . ."
How often do you see wild rabbits? Today's quote is from award-winning Native American writer Nila NorthSun, who is born of Shoshone, Chippewa, and Swedish descent. Not only is her poetry down-to-earth and accessible, but it deals with real issues faced by Native Americans struggling with how to keep their cultural traditions alive and relevant in a changing world. One of the coolest things about her, though, is the work she's done on behalf of Native American teens. She lived on the Fallon Paitue-Shoshone Reservation in Nevada and was the director for the Stepping Stones Program, which helps tribal youth who need a safe place to stay and medical care. The program also empowers youth to take control over their own futures. Keeping Traditions Alive: Dancers at the 2014 Eastern Shoshone Indian Days Powow. Wind River Indian Reservation, WY. By Gregory Nickerson. The Shoshone-Bannock Tribal Museum helps to preserve Shoshone and Bannock traditions and languages for future generations. Renegade Thought of the Day: Does your family have any cultural traditions? Think about your potential children and grandchildren: are there any family traditions they might have a difficult time celebrating or remembering? How would it feel to you to think about your family traditions being forgotten? Bonus Video: Celebrate Shoshone Heritage! If you were asked to build a bridge, what would it look like? I wish I could say that today's author, Red Hawk, is Native American. Unfortunately, I can't. His real name is Dr. Robert Moore and he's a professor of English at the University of Arkansas. From what I've gathered, he found the name red hawk (lower case intended) after spending some time in a sweat lodge. He also grew up being very interested in Native Americans and feeling in close kinship with Mother Earth, both of which come across in his poems. This week on my blog--which was kicked off with a day we once called Columbus Day--has been all about celebrating Native Americans. Yet on a deeper level, it's really about the shift in perspective that we can get from listening to the insights of people whose cultural values are different from our own. Red Hawk's poem "Two Ways of Crossing a Creek" embodies this shift, as you will see. Today I didn't start with a quote. Instead, I have a question I want to reflect upon for a minute: Someone asks you to build a bridge across a creek. What bridge do you see in your mind? Imagine what kind of bridge you'd build to help people safely cross this creek. Now, read Red Hawk's poem below, focusing on the imagery of the two different bridges and the two different cultural perspectives they represent. the CCC in the thirties. who were ruined by the times. heavily used by the traffic. stands on the other side. the man with the ropes waits. all over their bronze faces. when there's a fine bridge near? and hand me a beer. Renegade Thought of the Day: What about you: do you sometimes do things the hard way when a simpler solution would work just as well? What are some benefits from having friends from cultures that are different from our own? Renegade Challenge: Think about other cultures that you studied or visited. How has what you've learned shaped the way you live your life? Bonus Links: Here's some of the world's scariest bridges to get your adrenaline flowing. Anyone ready for a trip to Pakistan?? Click here to read a summary! An apple sauce making machine in full swing! Today's beautifully written passage is from the novel The Painted Drum , written by award-winning writer Louise Erdich, who is a member of the Turtle Mountain Band of Chippewa Indians. In today's excerpt, Erdrich's imagery of sitting under an apple tree, the earth beneath you sweet and strewn with apples, does seem comforting. After all, if the seasons were life, autumn would be our golden years, full of what we've produced, but also a time when we're becoming more acutely aware that things can die and even though some dreams come true, others turn to rot. Just like there's nothing to protect an apple tree from ultimately losing its apples, life is risky for us, too: loss is everywhere, and there's no protection from that. Perhaps like Erdrich helps us see, we can turn to nature for some solace. Just as in nature we see the apple tree lose its apples and foliage in the fall, we also see the blossoms return in the spring. Similarly, although some apples fall to the ground and turn to rot, some of their seeds manage to sprout and grow. Life is full of losses and gains. A painted frame drum, double membranophone. Ojibwe, Used in Akwesahne ceremony. Made by Rohahes Iain Phillips. Renegade Thought of the Day: Think about something you've lost in your life. Then, consider how you grew and what you gained from that experience. Renegade Challenge: Eat an apple and think about what it means to risk your heart.